There isn't one single nail in all of the trusses as they arrived from the manufacturer. What holds the various element of each truss is these nailing plates which are pressed into place at the factory. 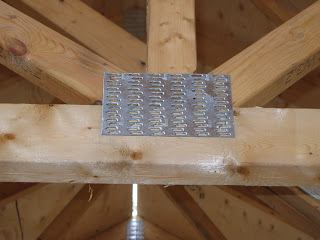 There is of course different sizes but the design is the same for all of the nail plates. These connectors have greater strength in the same plane as the truss but any other direction it is quite weak. We discovered this when we were heaving the trusses up on the framed walls. We had to be sure to support the trusses as we slid them up on to the walls. Basically the process to get the trusses up on the roof, when a crane is not available is to put one end up on the wall and then slide the rest up by shear muscle power. The trusses are all laying flat during this procedure, and prone to bending right at the nailed plate joints - so careful support during the process is needed. We were fortunate to have only broken one of the trusses and it was a minor fix to get it back into the right shape.